I started throwing ingredients together and this is what I came up with. 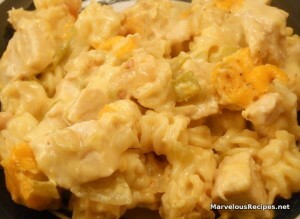 My family liked it so much, they ate the whole casserole–no leftovers! 1. Cook the pasta according to the package directions; drain and set aside. In a medium skillet over medium-high heat, cook the onion and celery in butter until tender; about 4 minutes. 2. In a large bowl, combine the soup, sour cream, chilies, pepper and chicken. Stir in the cooked pasta. Pour mixture into a 3-quart casserole sprayed with cooking spray. Top with the cheese. 3. Bake, uncovered, at 350 degrees F for 25 to 30 minutes or until hot and bubbly and cheese is melted. Makes 6 to 8 servings. I do like the recipe, and will be trying this soon, just had to make that small change… fresh peppers! I agree that fresh does taste best, but please remember that working moms don’t always have the time to do a lot of preparation, especially after a hard day at work. They want something simple, fairly quick-to-make and that tastes good. That’s why I recommend canned and frozen products in many of my recipes. My readers are always free to substitute fresh ingredients when they have them available and have the time to prepare them. I’m pretty sure my family would do the same with this dish!